무선 통신 장치는 전송해야 할 데이타를 중간 주파수(IF) 신호로 변조시키고 수신된 고주파수 신호로부터 도출된 IF 신호를 복조시키기 위한 기저 대역 프로세서를 포함한다. The wireless communication apparatus includes a baseband processor for demodulating the IF signal derived from the data to be transmitted and received high frequency signal modulated to an intermediate frequency (IF) signal. 프론트 엔드부는 기저 대역 프로세서로부터 IF 신호를 수신하여 이 IF 신호를 전송을 위해 고주파수 신호로 변환시킨다. The front end section receives the IF signal from the baseband processor and converts the IF signal into a high frequency signal for transmission. 프론트 엔드부는 또한 원격지로부터 고주파수 신호를 수신하여 복조 및 데이타 복원을 위해 수신된 고주파수 신호를 IF 신호로 변환시켜 기저 대역 프로세서에 공급하도록 구성되어 있다. The front end section also is configured to convert the high frequency signal received by receiving a high frequency signal from a remote location for demodulation and data recovery to the IF signal supplied to the baseband processor. 프론트 엔드부는 복수의 주파수 대역에서 동작가능하고, 주파수 대역 중 선택된 주파수 대역에서 무선 주파수 채널로서 사용하기 위한 주파수로 튜닝가능하다. The front end section may be tuned to a frequency for use as a radio frequency channel in a frequency band of the selected operable in a plurality of frequency bands, and frequency bands. 따라서, 동일 영역에 동시에 할당되는 채널의 수를 상당히 증가시킬 수 있으므로, 통신 링크의 인터럽팅 가능성을 상당히 감소시킬 수 있다. Thus, it is possible to significantly increase the number of channels allocated at the same time in the same area, the possibility of interrupting a communication link is significantly reduced. 본 발명은 무선 LAN(Local Area Network:근거리 통신망) 시스템에서의 특별한 이용성을 갖는 무선 통신 장치, 특히, 교란과 간섭을 나타내는 환경에서 동작할 수 있는 무선 통신 장치에 관한 것이다. The present invention is a wireless LAN: related to a wireless communication device capable of operating in a wireless communication device, in particular, showing the environment disturbance and interference with a particular utilization of the (Local Area Network LAN) system. 무선 LAN 시스템은 빌딩, 거주지역, 주택 내에서 혹은 방 안에서와 같은 제한된 영역에서 장치들 사이에서 통신하기 위하여 제안되어져 왔다. Wireless LAN systems have been proposed in order to communicate between a limited area such as a room or inside in the building, residential, housing unit. 이러한 목적을 위하여, IEEE(The Institute of Electrical and Electronics Engineers, Inc.) 802.11 표준규격은 이러한 무선 LAN 시스템에 이용될 수 있는 무선 주파수 대역으로서 2.4 GHz 대역을 규정한다. For this purpose, IEEE (The Institute of Electrical and Electronics Engineers, Inc.) 802.11 standard specifies a 2.4 GHz radio band as a frequency band that can be used in such a wireless LAN system. 도 1은 송신용의 패킷을 수집하고 수신된 패킷을 분리하는 미디어 액세스 제어기(MAC)(91)에 의해 송신된 데이타가 데이타 전송용의 패킷으로 변환되는 2.4 GHz 대역의 무선 LAN 시스템을 도시한다. Figure 1 illustrates a wireless LAN system of the 2.4 GHz band is converted into a packet for the data transmission the transmitted data by the media access controller (MAC) (91) for separating the packets collected by the packet is transmitted from the transmitting and receiving. 데이타 패킷은, 송신용의 데이타 패킷을 변조하고 데이타가 수신되었을 때 IF 신호를 복조하는 기저 대역 프로세서(BBP)(92)에 의해 고속 송신 레이트로 수백 MHz 정도의 중간 주파수(IF) 신호로 변조된다. Data packet and is modulated to an intermediate frequency (IF) signal of a several hundred MHz degree at a high transmission rate by a baseband processor (BBP) (92) for demodulating the IF signal when modulating the data packets for transmission, and data is received, . 중간 주파수 신호는 프론트 엔드부(93)에 의해 2.4 GHz 대역 내의 선택된 무선 주파수의 고주파수 신호로 변환되고, 고주파수 신호는 안테나(99)로부터 송신된다. Intermediate frequency signal is converted into a high frequency signal of the selected radio frequency in the 2.4 GHz band by a front end unit 93, a high-frequency signal is transmitted from the antenna (99). 무선 통신 장치에 의해 데이타를 수신하면, 다른 무선 통신 장치로부터 송신된 고주파수 신호는 안테나(99)에 의해 수신되어 프론트 엔드부(93)에 의해 중간 주파수 신호로 변환된다. When receiving the data by the radio communication apparatus, the high frequency signal transmitted from another wireless communication apparatus are received by the antenna 99 is converted into an intermediate frequency signal by the front end portion (93). 이 IF 신호는 기저 대역 프로세서(92)에 의해 복조되어 데이타를 패킷의 형태로 복원하고, 이 복원된 데이타 패킷들은 미디어 액세스 제어기(91)에 의해 분리된다. The IF signal is demodulated by the baseband processor 92 restores the data in the form of packets, and the restored data packets are separated by a media access controller (91). 기저 대역 프로세서(92)는 복조-변조 포맷으로서 CCK(Complementary Code Keying:상보형 코드 키잉) 포맷, OFDM(Orthogonal Frequency Division Multiplexing:직교 주파수 분할 멀티플렉싱) 포맷 또는 QPSK(Quadrature Phase Shift Keying:4위상 편이 키잉) 포맷을 이용할 수도 있다. Baseband processor 92 demodulates-modulating CCK as a format (Complementary Code Keying: keying complementary code) format, OFDM (Orthogonal Frequency Division Multiplexing: orthogonal frequency division multiplexing) format or the QPSK (Quadrature Phase Shift Keying: 4 keyed phase shift ) it can also be used to format. 이러한 무선 LAN 시스템에서, 상이한 장치들 간의 데이타 전송가능한 거리는 대략 100m 가시거리(line-of-sight)이다. In this wireless LAN system, the data transferable distance between different devices substantially line-of-sight (line-of-sight) 100m between. 따라서, 무선 LAN 시스템이 밀집도가 높은 지역에 위치한 빌딩에 있거나 또는 각 방들이 서로 가깝게 배치되어 있는 각 주택 혹은 각 방에 대하여 구축된다면, 무선파는 금속를 포함하지 않는 벽을 통하여 쉽게 전파되기 때문에, 수개의 간섭하는 무선 LAN 시스템이 한 지역에 동시에 존재할 수 있다. Thus, because the wireless LAN system to be density is on a building located in high areas or in each room are, if constructed for each house or each room are arranged close to each other, easily spread through the wall does not include geumsokreul wave radio, several interference wireless LAN system that can exist simultaneously in one area. IEEE 802.11 표준규격은 2.400 부터 2.483 GHz 까지의 2.4 GHz 대역에 할당된 11 채널(채널 1부터 채널 11까지)을 규정하며, 각 채널은 5 MHz 이격된 각각의 주파수로 설정된다. It defines the IEEE 802.11 standard is a 11 channel (channel to the channel 11 from one) assigned to the 2.4 GHz band from 2.483 GHz to 2.400, and each channel is set to each of the frequency 5 MHz apart. 동일 영역 내에서 복수개의 채널을 동시에 수용하기 위하여, 그 영역에서 이용될 수 있는 인접한 채널 사이의 주파수 간격은 도 2에 개략적으로 도시된 바와 같이 25 MHz 이상이다. In order to accommodate a plurality of channels simultaneously within the same area, the frequency interval is 25 MHz or more as schematically shown in Figure 2 between adjacent channels that can be used in that area. 이러한 방법으로, 고주파수 신호는 변조된 고정 대역을 가지기 때문에, 인접 채널의 주파수가 5MHz 만큼 이격된 것처럼 서로 가깝다면, 한 채널의 신호는 다른 채널의 신호에 대해 교란하는 무선파로서 작용할 것이다. In this way, the high frequency signal because it has a modulated fixed bandwidth, if the frequency of the adjacent channel close to each other as spaced by a 5MHz, the signal of one channel is to serve as the radio waves that the disturbance to the signals of other channels. 따라서, 동일 영역 내에서 동시 사용을 위해 할당되어져야만 하는 2.4 GHz 대역에 있는 채널의 수는 도 2에서 채널 1, 6 및 11로 표시된 것처럼 최대 3으로 제한되어져야만 한다. Thus, it perfected the number of channels in the 2.4 GHz band that should be assigned for simultaneous use is limited to a maximum of 3, as indicated by channels 1, 6 and 11 in Figure 2 in the same area. 그 결과, 무선 LAN 시스템이 조밀하게 밀집된 구역 내의 각 빌딩 혹은 각 주택 혹은 각 방에 대해 사용된다면 이용가능한 충분한 채널이 없을 수 있다. As a result, there may not be enough channels available if the wireless LAN system is densely used for each building or each house or each room in the densely populated areas. IEEE 802.11 표준규격은, 비록 전송 레이트가 낮을지라도, 동일 채널의 자유 시간을 공유하는 동안에 통신 링크를 보증하는 통신 프로토콜을 허용한다. The IEEE 802.11 standard specification, although the transmission rate is low, allowing a communication protocol to ensure a communication link while the share of free time on the same channel. 그러나, IEEE 802.11 표준규격을 따르지 않는 무선파, 또는 무선 LAN 시스템에서 통신을 교란할 수도 있는 예를 들어 마이크로웨이브 오븐의 무선파 누출 또는 디지탈 무선(cordless) 전화의 무선파 통신과 같은 무선 간섭은 무선 LAN 시스템의 동작 영역 내에 존재할 수도 있고, 2.4 GHz 대역 내에 있을 수 있다. However, the radio interference such as radio wave communication of the IEEE 802.11 radio waves that do not conform to the standard specification, or telephone radio wave leakage or digital radio (cordless) of the microwave oven, for example, which may disturb the communication in a wireless LAN system, a wireless LAN system, may be present in the operating region, it may be in the 2.4 GHz band. 그 결과, 이미지 데이타 또는 음성 데이타는 이러한 교란하는 무선파의 환경에서 무선 LAN 시스템을 통하여 실시간으로 만족스럽게 송신되지 않을 수도 있다. As a result, image data or audio data may not be satisfactorily transmitted in real-time through a radio LAN system in the disturbance radio waves to this environment. 최근에, IEEE 802.11 표준 규격은 무선 LAN 시스템을 위한 주파수 대역으로서 5 GHz 대역을 제안해왔다. Recently, IEEE 802.11 standard has been proposed for the 5 GHz band as the frequency band for the wireless LAN system. 그 결과로서, 무선 LAN 시스템을 위한 통신 대역으로써 2.4 GHz 대역 대신에 5 GHz 대역을 이용할 수 있다. As a result, as the communication band for a radio LAN system can be used for the 5 GHz band in place of the 2.4 GHz band. 그러나, 2.4 GHz 대역에서 발생할 수 있었던 것처럼 동일한 장해 및 어려움들이, 5 GHz 대역에 대해서도 발생할 수 있으므로, 5 GHz 대역에서 인접한 채널간의 주파수 간격은, 복수개의 채널이 특히 밀집된 지역에서 동일 영역 내에서 이용되는 40 MHz 이상이어야만 한다. However, the same disorder, as could occur in the 2.4 GHz band and the difficulties are, it may occur also in the 5 GHz band, the 5 frequency interval between adjacent channels in the GHz band, a plurality of channels, particularly for use in the same area in densely populated areas more than 40 MHz should be the. 따라서, 5 GHz 대역에서 동일 영역 내에서 채널 간의 간섭을 일으킴이 없이 동시에 이용될 수 있는 채널의 수는 도 3에 도시된 것처럼 4로 제한된다. Thus, in the 5 GHz band, the number of channels that can be used at the same time without this causing the interference between channels in the same area is limited to 4 as shown in Fig. 또한 여기에서, 마이크로웨이브 누출 또는 디지탈 무선 전화기로부터와 같은 외부 교란 또는 간섭이 존재하면, 무선 LAN 시스템이 조밀하게 밀집된 지역에 있는 각 빌딩 또는 각 주택 또는 각 방에 대해 이용되는 경우에, 충분한 수의 채널이 이용가능하지 않을 수 있다. In addition, in the case where, if the external disturbances or interference, such as from microwave leakage or digital cordless phone is present, which is used for each building or for each house or for each room in the wireless LAN system dense dense region, a sufficient number of this channel may not be available. 본 발명은 동일 영역 내에서 동시에 할당되어질 수 있는 채널의 수를 증가시키고 통신 링크가 간섭이나 교란에 의해 간섭받을 가능성을 감소시킨, 무선 LAN 시스템에 대해 매우 적합한 무선 통신 장치를 제공한다. The present invention provides a very suitable radio communication system for increasing the number of channels that can be assigned simultaneously within the same area and reduces the possibility of receiving the communication link is interference by the interference or disturbance, the wireless LAN system. 본 발명의 무선 통신 장치는 단일 대역 무선 LAN 시스템을 형성하기 위하여 기존의 대중적 무선 통신 장치와 결합되기에 매우 적합하다. Wireless communication apparatus according to the present invention is well suited to be combined with existing popular radio communication equipment so as to form a single band radio LAN system. 본 발명의 무선 통신 장치는 바람직하게는 송신되어질 데이타를 IF 신호로 변조하고 수신된 고주파수 신호로부터 도출된 IF 신호를 복조하기 위한 기저 대역 프로세서를 포함한다. Wireless communication apparatus according to the present invention preferably includes a baseband processor for demodulating the IF signal derived from the modulated and receive data to be transmitted into an IF signal a high frequency signal. 프론트 엔드부는 기저 대역 프로세서로부터 IF 신호를 수신하여, 그 IF 신호를 송신용의 고주파수 신호로 변환한다. The front end section receives the IF signal from the baseband processor, converts the IF signal into a high frequency signal for transmission. 또한, 프론트 엔드부는 원격지로부터 고주파수 신호를 수신하여, 수신된 고주파수 신호를 복조 및 데이타 복구를 위한 기저 대역 프로세서로 공급되는 IF 신호로 변환한다. Further, the front end section receiving a high frequency signal from a remote location, and converts the received high frequency signal into an IF signal which is supplied to the baseband processor for demodulation and data recovery. 프론트 엔드부는 복수개의 주파수 대역에서 동작가능하며, 무선 주파수 채널로써 이용하기 위하여 주파수 대역 중의 선택된 것 내의 주파수로 튜닝가능하다. The front end section may be tuned to a frequency within a selected one of the frequency band to use, and operable in a plurality of frequency bands, as a radio frequency channel. 그 결과, 동일 영역에서 동시에 할당되는 채널의 수는 현저하게 증가될 수 있으며, 통신 링크를 인터럽팅하는 가능성은 상당히 줄어든다. As a result, the number of channels to be allocated at the same time in the same area can be markedly increased, the possibility of interrupting a communication link is significantly reduced. 프론트 엔드부는 복수개의 프론트 엔드 회로를 포함할 수 있으며, 각각은 주파수 대역 중의 하나에 대응한다. The front end section may include plural front end circuits, each corresponding to one of the frequency bands. 대안으로, 프론트 엔드부는 주파수 대역들에 공통인 하나의 프론트 엔드 회로를 포함할 수 있다. Alternatively, the front end section may include one front end circuit that is common to frequency bands. 본 발명의 한 특징으로서, 주파수 전환(change-over) 선택기는 주파수 대역 중의 하나 및 최소의 교란을 갖는 통신을 위해 선택된 주파수 대역 내의 주파수 채널을 선택한다. As a feature of the invention, the frequency conversion (change-over) selector selects a frequency channel within the selected frequency band for communication with one of the band and the minimum of disturbance. 본 발명의 다른 특징에 따르면, 기저 대역 처리부는 데이타를 변조하고 복조하기 위하여 복수개의 변조-복조 스킴, 혹은 포맷 중에서 임의의 하나를 이용할 수 있다. In accordance with another feature of the invention, the baseband processor has a plurality of modulation to modulate and demodulate the data-can be used in any one of the demodulation schemes, or formats. 그러므로, 주파수 대역, 주파수 채널 및 변조 포맷은 선택되고 변형되어 통신을 개선시키고 신뢰성을 증대시킬 수 있다. Therefore, a frequency band, frequency channel and modulation format are selected and transformed can improve communication and increase reliability. 바람직하게, 주파수 대역은 2.4 GHz 대역 및 5 GHz 대역을 포함하며, 변조-복조 포맷은 CCK 및 OFDM을 포함한다. The demodulation formats include CCK and OFDM - preferably, the band comprises a 2.4 GHz band and the 5 GHz band, modulated. 전형적으로, 제어부가 2.4 GHz 대역을 선택 할 때는, CCK 포맷이 사용되고, 5 GHz 대역이 선택될 때는, OFDM 포맷이 사용된다. Typically, when the controller selects the 2.4 GHz band, the CCK format is used when it is, select the 5 GHz band, the OFDM format is used. 본 발명에 따르면, 주어진 영역에 할당될 수 있는 주파수 채널의 수가 현저히 증가되는 한편, 기지 단말과 휴대형 단말 간의 통신 링크가 외부 요인에 의해 인터럽트될 가능성이 최소화된다. According to the invention, this possibility is minimized which significantly increased the number of frequency channels that can be assigned to a given region other hand, the communication link between the base terminal and the portable terminal is to be interrupted by an external factor. 또한, 본 발명의 무선 통신부는 효율적으로 저가로 구성될 수 있다. In addition, the wireless communication unit of the present invention can be efficiently composed of a low cost. 도 4를 참조하면, 본 발명에 따른 무선 통신 기기를 구현하는 무선 LAN 시스템의 한 예를 도시한다. Referring to Figure 4, there is shown an example of a wireless LAN system that implements the wireless communication apparatus according to the invention. 도시된 시스템은 기지 단말(또는 기지 유닛)(10) 및 휴대형 단말(40)을 포함한다. The illustrated system includes a base terminal (or base unit) 10 and the portable terminal 40. 기지 단말(10)은 전화 회선(1)을 통해 외부 기기에 결합되어, 외부 기기와의 전화 통신을 가능하게 한다. The base terminal 10 is coupled to an external device via a telephone line (1), it allows for telephone communication with an external apparatus. 이러한 외부 기기의 예로는 인터넷, 데이터기지, 원격 단말 등이 포함되며, 이들 각각은 전화 회선을 통해 기지 유닛과 통신하기에 적합하다. Examples of such external equipment is suitable for the Internet, data bases, and contains the remote terminal or the like, each of which communicate with the base unit via a telephone line. 기지 유닛(10)은 또한 셋 탑 박스(STB;3), 디지털 만능 디스크 플레이어(DVD;4), 디지털 비디오 테이프 레코더(D-VTR;5) 등의 비디오 테이프 레코더 등의 다양한 외부 기기에 결합된다. Base unit 10 is also a set top box (STB; 3), a digital versatile disk player (DVD; 4); is coupled to a variety of external devices such as a video tape recorder such as a digital video tape recorder (5 D-VTR) . 하드 와이어, 적외선 또는 무선 접속일 수도 있는 이러한 접속에 의해, 오디오 및/또는 비디오 정보가 이들 외부 디바이스로부터 기지 유닛(10)으로 전송되고, 이와 유사하게, 동작 제어 데이터 외의 오디오 및/또는 비디오 정보가 기지 유닛으로부터 외부 디바이스로 전송될 수도 있다. By a hard-wired, infrared or radio jeopsokil this connection that may, audio and / or video information is transmitted to the base unit 10 from these external devices, similarly, audio and / or video information other than the operation control data base It may be transmitted from the unit to an external device. 기지 유닛(10)은 동작 제어부(17), 무선 통신부(70) 및 안테나(79)를 포함하 며, 이들 모두는 예를 들어 도 5와 관련하여 아래에 좀더 상세히 후술될 것이다. Base unit 10, including operating said control unit 17, wireless communication unit 70 and antenna 79, all of which for example will be described later in more detail below with respect to Fig. 무선 통신부(70) 및 안테나(79)에 의해 기지 유닛(10)에 제공되는 오디오 및/또는 비디오 정보가 외부 디바이스(3, 4, 5 등)로부터 휴대형 단말(40)에 전송될 수 있고, 이와 유사하게, 휴대형 단말의 사용자가 안테나(79) 및 무선 통신부(70)를 통해 사용자-개시 제어 데이터를 기지 단말에 전송함으로써 외부 디바이스 외의 기지 단말에서 적절한 제어를 행할 수 있게 된다. And audio and / or video information supplied to the base unit 10 by the wireless communication unit 70 and antenna 79 may be transmitted to the portable terminal 40 from an external device (3, 4, 5, etc. ), on the other Similarly, the user of the portable terminal through the antenna 79 and the wireless communication unit 70, the user - it is possible to perform an appropriate start control at the base station other than the external device by sending control data to the base station. 휴대형 단말(40)은 화상을 표시할 수 있는 액정 표시(LCD) 유닛(41), 가청 정보를 발생하기 위한 스피커(43) 및 가청 사운드를 대응하는 전기 신호로 변환하기 위한 마이크로폰(45)을 포함한다. Portable terminal 40 includes a microphone 45 for converting into an electrical signal corresponding to the speaker 43 and the audible sound for producing a liquid crystal display (LCD) unit 41, the audio information to display an image do. 기지 단말(10)과 같이, 휴대형 단말은 무선 통신부(70) 및 안테나(79)를 포함한다. As base terminal 10, a portable terminal includes a radio communication section 70 and antenna 79. 휴대형 단말(40)은 동작 제어부(17)와 유사하며 도 6에 보다 특정하게 도시된 동작 제어부(47)를 더 포함한다. The portable terminal 40 further includes an operation controller 17 similar to that shown and operate in more particular in Figure 6 the controller 47. 도 5를 참조하면, 기지 단말(10)은 보다 상세히 도시되어 있으며, 무선 통신부(70) 및 제어 유닛(20)을 포함하는 것으로 도시되어 있다. 5, and the base terminal 10 is shown in detail than can be seen to include a wireless communication unit 70 and control unit 20. 제어 유닛은 중앙 처리 유닛(CPU)(21)의 제어하에 정보가 전송되는 버스(22)로 구성된다. The control unit is composed of a bus 22 to which information is transmitted under the control of a central processing unit (CPU) (21). ROM(23)은 버스(22)에 결합되며, CPU(21)에 의해 실행되는 소프트웨어 프로그램을 저장한다. ROM (23) is coupled to the bus 22, and stores a software program executed by the CPU (21). RAM(24) 또한 버스에 결합되며, 특히 CPU의 동작을 위한 통상의 작업 영역을 제공하는 일시 저장 디바이스로서 기능한다. RAM (24) also coupled to the bus and functions as a temporary storage device, in particular to provide a normal working area for the operation of the CPU. 모뎀(31)은 버스(22)에 결합되며, 제어 유닛(20)과 전화 회선(1)간의 통상의 인터페이스를 제공한다. Modem 31 provides the conventional interface between coupled to bus 22, the control unit 20 and the telephone line (1). 또한, 개략적으로 도시된 바와 같이, 다른 외부 디바이스(도시되지 않음) 외에도 셋 탑 박스(3), 디지털 만능 디스크 플레이어(4), 비디 오 레코더(5)가 인터페이스(I/F) 회로(33, 34 및 35) 각각을 통해 버스(22)에 결합된다. In addition, as schematically it is shown, and the other external devices (not shown) in addition to a set top box 3, digital versatile disk player 4, video recorder 5, an interface (I / F) circuit (33, 34 and 35) are coupled to the bus 22 through each. 이들 I/F 회로는 무선 통신부(70)(후술되는 바와 같이)에 의한 휴대형 단말(40)로의 통신을 위해 기지 단말(10)에 제공되는 오디오 및/또는 비디오 정보용의 인터페이스를 제공하며, 채널 선택, 재생, 정지 등의 각각의 동작을 제어하기 위해 기지 단말로부터 외부 디바이스로 제어 데이터가 전송될 수 있게 한다. These I / F circuits provide the wireless communication unit 70 interface for audio and / or video information supplied to the base terminal 10 for communication to portable terminal 40 by (as described below), channel allow selection, reproduction, control data from the base station to control each operation of the stoplight to the external device may be transmitted. 동작부(17)는 또한 인터페이스 회로(37)에 의해 버스(22)에 결합된다. Operation unit 17 is also coupled to bus 22 by an interface circuit 37. 무선 통신부(70)는 후술되는 적절한 무선 주파수에 의해 제어 데이터 외에 오디오 및/또는 비디오 정보(이하, A/V 정보라 칭함)를 휴대형 단말(40)에 전송하기에 적합하다. Radio communication section 70 is adapted to transmit data in addition to control by means of appropriate radio frequency below the audio and / or video information (hereinafter referred to as, A / V information) to the portable terminal 40. 이와 유사하게, 무선 통신부는 고주파 무선 전송에 의해 휴대형 단말로부터 기지 단말에 결합된 외부 디바이스를 제어하는 데 사용되는 제어 데이터 및 다른 정보를 수신하고, 전화 회선(1)을 통해 인터넷 등의 외부 네트워크와 상호 작용할 수 있게 한다. Similarly, the wireless communication unit is an external network such as the Internet via the receive control data and other information used to control an external device, and a telephone line (1) coupled to the base terminal from the portable terminal by using the high frequency radio transmission, and It allows to interact. 무선 통신부(70)는 미디어 액세스 제어기(MAC;71), 기저 대역 프로세서(BBP;72) 및 멀티-대역 프론트 엔드부(73)를 포함한다. And a band front-end unit (73) -; (72 BBP) and Multi; wireless communication unit 70 is a media access controller (MAC 71), the baseband processor. 미디어 액세스 제어기는 차례로 버스(22)에 결합된 입출력 I/O 포트(25)에 의해 제공되는 정보로부터 데이터 패킷을 수집하는데 적합하다. A media access controller is adapted to collect the data packet from information provided by the then bus 22. The input-output I / O port 25 is coupled to. 비디오 액세스 제어기(71)는 또한 예를 들어 휴대형 단말(40)로부터 수신된 데이터 패킷을 분리하고 분리된 데이터를 데이터가 적절한 외부 디바이스 또는 외부 네트워크에 결합된 I/O 포트(25) 제공하기에 적합하다. Video access controller 71 is also adapted to provide for example, a portable terminal the I / O port 25 is coupled to the separation of the data packet received from the 40 and separation data data to the appropriate external device or external network Do. 기저 대역 프로세서(72)는 상술된 CCK, OFDM 혹은 QPSK 포맷 등의 선택 변조 포맷에 따라 미디어 액세스 제어기(71)로부터 전송되는 데이터 패킷을 변조하는 동 작을 한다. The baseband processor 72 is small for modulating a data packet transmitted from the media access controller 71 in accordance with the selected modulation format, such as the aforementioned CCK, OFDM or QPSK formats simultaneously. 변조된 데이터 패킷은 수백 MHz 정도의 중간 주파수(I/F)로 변조된다. The modulated data packets are modulated to an intermediate frequency (I / F) of about several hundred MHz. 이러한 IF 신호는 기저 대역 프로세서(72)로부터 상향 변환 및 원하는 경우 안테나(79)를 통한 송신을 위해 고주파수로 다시 변환을 위해 프론트 엔드부(73)로 송신된다. This IF signal is sent to the up-conversion and front-end unit 73 for re-conversion to high frequency for transmission over an antenna 79. If desired, from the baseband processor 72. 유사하게, 휴대형 단말(40)로부터 전송되는 고주파수 신호는 안테나(79)에 의해 수신되며, 변조된 데이터 패킷을 포함하는 IF 신호를 얻기 위해 프론트 엔드부에 의해 하향 변환된다. Similarly, the high frequency signal transmitted from the portable terminal 40 is down-converted by the front end portion to be received by the antenna 79, obtaining the IF signal including the modulated data packet. 이렇게 도출된 IF 신호의 IF 주파수는 상향 변환되고 휴대형 단말에 전송되는 IF 신호의 IF 주파수와 동일할 수도 있다. IF frequency of this derived IF signal may be the same as the IF frequency of the IF signal is up-converted and transmitted to the portable terminal. 도출되거나 복원된 IF 신호는 미디어 액세스 제어기(71)에 의해 공급되고 분리되는 데이터 패킷을 복원하기 위해 기저 대역 프로세서(72)에 의해 복조된다. Derived or the restored IF signal is demodulated by baseband processor 72 to recover the data packet supplied by the media access controller 71 is separated. 따라서, A/V 정보, 커맨드 데이터 등의 데이터는 데이터 패킷으로 수집되고, IF 주파수로 변조되며, 무선 고주파로 상향 변환되어 프론트 엔드부(73)로부터 휴대형 단말(40)에 전송된다는 것을 알 수 있을 것이다. Thus, data such as A / V information, command data is collected into data packets, modulated to an IF frequency, is up-converted to a radio high-frequency be seen that the transfer to the portable terminal 40 from the front-end section 73 will be. 또한, 휴대형 단말로부터 기지 단말(10)로 복귀되는 정보 및 커맨드 데이터를 포함하는 데이터는 안테나(79)에 의해 무선 고주파로 수신되어, 프론트 엔드부(73)에 의해 하향 변환되고, 기저 대역 프로세서(72)에 의해 복조되고, 미디어 액세스 제어기(71)에 의해 패킷 분리되어 I/O 포트(25)에 의해, 기지 단말(10)에 결합된 외부 디바이스 또는 외부 네트워크에 공급된다. In addition, the data including information and command data to be returned to the base terminal 10 from the portable terminal is received by the wireless high-frequency by the antenna 79, and down-converted by front end section 73, a baseband processor ( 72) and demodulated by a separate packet by the media access controller 71 is supplied to the external device or the external network coupled to base terminal 10 by the I / O port 25. 미디어 액세스 제어기(71)는 인터페이스(I/F) 회로(26)에 의해 버스(22)에 결합되어 송신/수신 제어 신호, 주파수 대역 선택 제어 신호 및 변조 포맷 제어 신 호와 같은 적절한 제어 신호를 수신한다. Receiving an appropriate control signal, such as a media access controller 71 includes an interface (I / F) circuit 26, transmission / reception is coupled to the bus 22 by the control signal, a frequency band selection control signal and a modulation format control signal do. 이들 제어 신호는 특히 미디어 액세스 제어기가 전송용 데이터 패킷을 수집하거나 수신되는 데이터 패킷을 분리하도록 무선 통신부(70)가 송신 혹은 수신 모드에서 동작하는지 여부를 결정하는 데 사용된다. These control signals are used to determine whether or not the radio communication section 70 operates in a transmit or receive mode to a particular media access controller disconnect the data packets to be collected or received a data packet for transmission. 이와 유사하게, 송신/수신 제어 신호는 기저 대역 프로세서(72)에 의해 변조 또는 복조 동작을 수행하는 데 사용된다. Similarly, the transmit / receive control signal is used to perform modulation or demodulation operations by the baseband processor 72. I/F 회로(26)로부터 공급된 변조 포맷 제어 신호는 기저 대역 프로세서(72)에 의해 이들 제어 신호에 의해 결정된 변조 포맷을 선택하는 데 사용된다. I / F modulation format control signal supplied from the circuit 26 is used to select the modulation format determined by these control signals by the baseband processor 72. 대역 선택 제어 신호는 프론트 엔드부가 상이한 주파수 대역의 상이한 주파수 채널로 조정되어 교란 및 있음직한 간섭의 환경에서도 최적의 통신을 보장하도록 프론트 엔드부(73)를 제어한다. Band selection control signal controls front end section 73 so as to ensure optimum communication even be adjusted to different frequency channels of a frequency band different from the front end portion of the environmental disturbance and probable interference. 예를 들어, 양호한 실시예에 따르면, 프론트 엔드부는 2.4 GHz 대역의 주파수 채널 또는 5 GHz 대역의 특정 주파수 채널로 조정될 수도 있다. For example, according to a preferred embodiment, the front end section may be adjusted to a specific frequency channel of a frequency channel or a 5 GHz band in the 2.4 GHz band. 즉, I/F 회로(26)로부터 공급된 대역 선택 제어 신호의 제어하에 도 3에 개략적으로 도시된 다수의 주파수 채널중 하나외에도, 도 2에 개략적으로 도시된 다수의 주파수 채널중 하나가 선택될 수도 있다. That is, I / F in addition to one of the schematic multiple frequency channels illustrated in Figure 3, under the control of a band selection control signal supplied from the circuit 26, one of the plurality of frequency channels schematically depicted in Figure 2 is selected may. 대역 선택 및 변조 포맷 제어 신호가 결정되는 방식에 대해서 후술될 것이다. It will be described below with respect to the band selection and modulation format control signals are determined to be. 도 6은 휴대형 단말(40)의 개략 블럭도이며, 제어 유닛(20)과 유사한 제어 유닛(50) 외에도 도 5와 관련하여 상술한 무선 통신부(70)와 유사한 무선 통신 유닛(70)을 포함하는 것이 도시되어 있다. Figure 6 comprises a schematic block diagram of a control unit 20, similar to control unit 50, wireless communication unit 70 is similar to the radio communication unit 70 described above in addition to the connection with Figure 5 of the portable terminal 40 it is illustrated. 간략화를 위해, 도 6의 무선 통신 유닛(70)은 더 이상의 상세한 설명은 하지 않기로 한다. For the sake of simplicity, the radio communication unit 70 of Figure 6 and will not have any further detailed description. 제어 유닛(20)과 같은 제어 유닛(50)은 CPU(51)(CPU(21)과 유사함), ROM(53)(ROM(23)과 유사함), RAM(54)(RAM(24)과 유사함), I/F 회로(56)(I/F 회 로(26)와 유사함) 및 I/O 포트(55)(I/O 포트(25)와 유사함)를 포함한다. A control unit control unit 50, such as 20 (similar to the ROM (23)), CPU (51) (CPU (similar to 21)), ROM (53), RAM (54) (RAM (24) and it comprises a similar box), similar to the I / F circuit (56) (I / F times with 26 similar to), and I / O port (55) (I / O port 25). 도 6의 CPU, ROM, RAM, I/F 회로 및 I/O 포트는 상술한 버스(22)와 유사한 버스(52)에 결합된 것이 도시되어 있다. Fig of 6 CPU, ROM, RAM, I / F circuit and I / O ports is shown is coupled to a similar bus 52 to the above-described bus 22. LCD 유닛(41)은 표시 제어 회로(61)에 의해 버스(52)에 결합되어 있으며, 기지 단말로부터 휴대형 단말로 전송되는 분리된 데이터 패킷으로부터 복원된 비디오 정보를 표시하는 데 적합하다. LCD unit 41 is suitable for displaying the video information restored from the separated data packets and is coupled to the bus 52 by the display control circuit 61, transmitted from the base station to the portable terminal. 유사한 방식으로, 스피커(43)는 분리된 데이터 패킷으로부터 복원된 오디오 정보를 수신하여 오디오 정보를 디지털/아날로그(D/A) 변환기에 공급하여 아날로그 오디오 신호에 의해 스피커(43)를 구동하는 인터페이스 회로(62)에 의해 버스(52)에 결합된다. In a similar manner, the speaker unit 43 which drives the speaker 43 by analog audio signals and to receive audio information restored from the separated data packet supplying audio information to a digital / analog (D / A) converter interface circuit It is coupled to bus 52 by 62. 마이크로폰(45)은 마이크로폰으로부터 아날로그/디지털(A/D) 변환기(64)에 의해 변환된 디지털 오디오 정보를 수신하는 인터페이스 회로(65)에 의해 버스(52)에 결합된다. Microphone 45 is coupled to bus 52 by an interface circuit 65 for receiving the digital audio information converted by the analog / digital (A / D) converter 64 from the microphone. 따라서, 마이크로폰으로부터의 디지털화된 오디오 정보는 고주파수 무선 통신을 통해 기지 단말에 정송되는 데이터 패킷으로의 수집을 위해 I/O 포트(55)에 의해 미디어 액세서 제어기(71)에 공급된다. Thus, digitized audio information from the microphone are supplied to the media accessor controller 71 by an I / O port 55 for the collection of the data packets jeongsong the base station over a high frequency wireless communication. 마지막으로, 상술된 동작부(17)와 유사할 수도 있는 동작부(47)는 인터페이스 회로(67)에 의해 버스(52)에 결합된다. Finally, operation section 47, which may be similar to the operation section 17 described above is coupled to bus 52 by an interface circuit 67. 도 5의 경우에서와 마찬가지로, A/V 정보를 포함하는 데이터 및 커맨드 데이터는 무선 통신부(70)에 의해 버스(52)로 및 버스로부터 전송된다. As in the case of Figure 5, the data and command data, including A / V information is transmitted from the bus and the bus 52 by radio communication section 70. 이러한 데이터는 예를 들어 마이크로폰(45) 및 동작부(47)로부터 버스에 공급될 수 있으며, LCD 유닛(41) 및 스피커(43)에 의한 표시를 위해 버스(52)로부터 수신될 수도 있다. Such data may, for example, may be received from a microphone 45 and may be fed from the operation unit 47 to the bus, LCD unit 41 and speaker 43, a bus 52 for display by the. 도 5에서 설명한 경우와 마찬가지로, 도 6의 I/F 회로(56)는 무선 통신부(70)에 대역 선택, 변조 포맷 및 송신/수신 제어 신호를 공급한다. As in the case described in Fig. 5, I / F circuit 56 of Fig. 6 and supplies the band selection, modulation format and transmit / receive control signal to the radio communication section 70. 이들 제어 신호는 I/F 회로(26)에 의해 무선 통신부에 공급된 제어 신호와 유사하므로 기지 단말과 동일한 변조 포맷으로 동일한 대역의 동일한 주파수로 동작할 수도 있다. The control signal may operate at the same frequency in the same band with the same modulation format as the base terminal is similar to the control signal supplied to the wireless communication section by I / F circuit 26. 이제, 무선 통신부에 포함된 구성 요소 외에도 무선 통신부(70)의 다양한 실시예에 대해서 도 7-20에 도시된 블럭도와 관련하여 설명하기로 한다. Now, in addition to the components included in the wireless communication it will be described with regard to Figure help the block shown in 7-20 with respect to various embodiments of the radio communication section 70. 기지 단말 및 휴대형 단말 모두에 동일한 무선 통신부가 사용되었으므로, 이러한 설명은 양쪽 단말에 적용될 수 있다. Since the same wireless communication in both the base terminal and the portable terminal used, this description is applicable to both terminals. 도 7을 참조하면, 프론트 엔드부(73)의 한 실시예가 보다 상세히 설명될 것이다. 7, will be described in more detail an example of one embodiment of front end section 73. 도시된 바와 같이, 프론트 엔드부는 도 5 및 6에 도시된 바와 같이, 미디어 액세스 제어기(71)에 차례로 결합된 기저 대역 프로세서(72)에 결합된다. As shown, the front end portion is coupled to, a baseband processor 72 coupled in turn to the media access controller 71, as shown in FIGS. 여기서, 프론트 엔드부(73)는 각각의 프론트 엔드 회로, 즉 2.4 GHz 대역에서 조정가능한 프론트 엔드 회로(80a) 및 5 GHz 대역에서 조정가능한 프론트 엔드 회로(80b)를 포함하는 것으로 개략적으로 도시된다. Here, front end section 73 is schematically illustrated as including an adjustable front-end circuit (80b) as possible from each of the front-end circuits, i.e., the adjustable front end circuit (80a) and the 5 GHz band in the 2.4 GHz band. 대역 선택 신호(S10)에 의해 제어되는 대역 선택기 스위치는 2.4 또는 5 GHz 대역의 무선 주파수 신호의 송신/수신을 위해 2.4 GHz 프론트 엔드 회로(80a) 또는 5 GHz 프론트 엔드 회로(80b)를 안테나(79)에 결합시킨다. A band selector switch 2.4 or 5 GHz band for transmission / reception of radio frequency signals of 2.4 GHz front end circuit for the (80a) or the 5 GHz front end circuit (80b) which is controlled by the band selection signal (S10) an antenna (79 ) it is coupled to. 이 실시예에서, 변조된 데이터 패킷은 2.4 GHz 대역 또는 5 GHz 대역중 어느 대역이 통신을 위해 선택되었는지에 따라 서로 다른 IF 주파수를 갖는 IF 신호로서 발생된다. In this embodiment, the modulated data packets are generated as IF signals having different IF frequencies, depending on whether the 2.4 GHz band or a 5 GHz band, which band is selected for communication of. 예를 들면, 기저 대역 프로세서(72)는 대역 통과 필터(74a)를 통해 프론트 엔드 회로(80a)에 공급된 IF 주파수 fia의 IF 신호를 발생시키고, 마 찬가지로 기저 대역 프로세서는 대역 통과 필터(74b)에 의해 프론트 엔드 회로(80b)에 공급된 IF 주파수 fib의 IF 신호를 발생시킨다. For example, the baseband processor 72 generates an IF signal of IF frequency fia supplied to the front-end circuit (80a) via the band-pass filter (74a), Similarly baseband processor is a band-pass filter (74b) by to generate an IF signal of IF frequency fib supplied to the front-end circuit (80b). 예를 들면, fia > fib이다. For example, fia> is fib. 각각의 프론트 엔드 회로가 무선 주파수 신호를 수신하여 하향 변환하도록 동작할 때, 프론트 엔드 회로(80a)는 IF 주파수 fia의 IF 신호를 발생시키고 프론트 엔드 회로(80b)는 IF 주파수 fia의 IF 신호를 발생시킨다는 것을 알 수 있다. When operating, each front end circuit to down-convert the received radio frequency signals, front end circuit (80a) generates the IF signal of IF frequency fia and front end circuit (80b) generates the IF signal of IF frequency fia it can be seen that sikindaneun. 프론트 엔드 회로(80a)는 2.4 GHz 대역의 특정 주파수를 발생시키기 위해 적절한 제어 전압에 의해 그 주파수가 제어되는 전압 제어 발진기(81a)를 포함한다. The front-end circuit (80a) includes a voltage controlled oscillator (81a) in which the frequency is controlled by a suitable control voltage to generate a particular frequency in the 2.4 GHz band. 이 제어된 주파수는 도 2에 개략적으로 도시된 주파수 채널 중의 하나이다. This controlled frequency is one of the frequency channels schematically depicted in FIG. 믹서(83a)는 발진기(81a) 및 대역 통과 필터(74a)에 접속되어, 대역 통과 필터로부터의 IF 신호를 발진기에 의해 선택된 주파수 채널로 상향 변환한다. A mixer (83a) is connected to the oscillator (81a) and a band pass filter (74a), and up-converting the IF signal from the band-pass filter to the frequency channel selected by the oscillator. 상향 변환 신호는 전압 제어 발진기가 튜닝되는 고주파수 채널 fa에서 송신하기 위해서 전력 증폭기(85a), 송신/수신 선택기 스위치(88a) 및 대역 선택기 스위치(75)에 의해 안테나(79)로 공급된다. Up-converted signal is supplied to the power amplifier (85a), the transmission / reception selector switch (88a) and a band selector antenna 79 by the switch 75 to transmit in the high frequency channel fa is a voltage controlled oscillator is tuned. 프론트 엔드 회로(80a)는 원격 위치로부터 안테나(79)로 송신된 고주파수 무선 신호를 수신하고 이 수신 신호를 IF 주파수 fia의 IF 신호로 하향 변환하기 위해 믹서(84a)로 공급하는 저잡음 증폭기(86a)도 포함한다. The front-end circuit (80a) is a low noise amplifier (86a) for receiving the high frequency radio signal transmitted from a remote location to antenna 79 and supplied to the mixer (84a) for down converting the received signal into an IF signal of IF frequency fia also it includes. 전압 제어 발진기(81a)가 튜닝되는 주파수는 이 하향 변환을 활성화하기 위해서 믹서(84a)에도 공급된다. Frequency at which the voltage-controlled oscillator (81a) is tuned is supplied to the mixer (84a) in order to enable the down-converted. 프론트 엔드 회로(80b)는 프론트 엔드 회로(80a)와 유사하게 구성되고 기저 대역 프로세서(72)로부터 공급된 IF 주파수 fib의 IF 신호를 전압 제어 발진기(81b)가 튜닝된 5 GHz 대역의 주파수 채널로 상향 변환하는데 사용된다. The front-end circuit (80b) is a frequency channel of the 5 GHz band, which is similarly constructed and the baseband processor 72, an IF frequency of the IF signal of the fib voltage controlled oscillator (81b) supplied from the front-end circuit (80a) tuned It is used to up-conversion. 이 상향 변환된 신호는 고주파수 채널 fb로서 믹서(83b) 및 전력 증폭기(85b)로부터 송신/수신 선택기 스위치(88b) 및 대역 선택기 스위치(75)를 통해 안테나(79)로 공급된다. The up-converted signal is supplied to mixer (83b) and a power amplifier (85b) antenna 79 through the transmission / reception selector switch (88b) and the band selector switch 75 from a high frequency channel fb. 마찬가지로, 수신된 고주파수 무선 통신은 IF 주파수 fib로 하향 변환을 위해 안테나로부터 저잡음 증폭기(86b) 및 스위치(75, 88b)를 통해 믹서(84b)로 공급된다. Likewise, received high frequency radio communication is supplied to the mixer (84b) via a low noise amplifier (86b) and a switch (75, 88b) from the antenna to the down-converted to the IF frequency fib. 도 7에 도시되지는 않았지만, 간섭 주파수의 과잉 방사를 최소화하거나 방지하기 위해 다양한 필터 회로가 각 프론트 엔드 회로에 제공될 수 있음을 알 수 있다. Although not shown in Figure 7, a variety of filter circuits to minimize or prevent excessive radiation of the interference frequencies to find out which may be provided for each front end circuit. 또한, 각 믹서가 개략적으로 단일 회로로서 도시되었지만, 본 발명의 기술분야의 당업자라면 각 믹서가 IF 주파수로부터 고주파수로 상향 변환하고 고주파수로부터 IF 주파수로 하향 변환하기 위한 다단계 믹서로서 구성될 수 있음을 알 것이다. Furthermore, although each mixer is schematically depicted as a single circuit, those skilled in the art that each mixer upstream from the IF frequency to a high frequency conversion and know that they can be configured as a multi-stage mixer for converting down to the IF frequency from the high frequency will be. 동작에 있어서, 무선 통신 장치의 사용자는 최선의 통신을 제공하는 주파수 대역, 그 대역의 주파수 채널, 및 변조 포맷을 초기에 선택한다. In operation, the user of the radio communication apparatus selects a frequency band, frequency channel and modulation format for that band to provide the best communication initially. 예를 들면, 기지단말(10) 및/또는 휴대형 단말(40)은 수신되고 있는 신호의 세기를 사용자에게 표시하는 적절한 신호 측정 및 표시 장치를 포함할 수 있다. For example, it may comprise suitable signal measurement and display apparatus for displaying the strength of the signal that the base terminal 10 and / or portable terminal 40 is received to the user. 사용자는 각 선택마다 신호 세기를 관측하면서 전압 제어 발진기를 다른 주파수 대역의 다른 주파수 채널에 튜닝할 수 있다. The user may tune the voltage controlled oscillator while observing the signal strength at each selection in different frequency channels in different frequency bands. 그리고, 최대 신호 세기를 보이는 주파수가 주파수 채널 fa 또는 fb로서 선택될 수 있다. And, the frequency showing the maximum signal strength can be selected as the frequency channel fa or fb. 일 실시예에서, 선택된 주파수 채널이 2.4 GHz 대역에 있을 때 CCK 포맷이 사용되고 선택된 주파수 채널이 5 GHz 대역에 있을 때 OFDM 포맷이 사용된다. In one embodiment, when the selected frequency channel is in the 2.4 GHz band, the CCK format is used and the OFDM format when the selected frequency channel is in the 5 GHz band is used. 대안적으로, 선택된 특정 주파수 대역에 상관없이, 사용자는 어 느 포맷이 더 큰 신호 세기를 제공하는가에 따라서 CCK 포맷 또는 OFDM 포맷 중의 하나를 선택할 수도 있다. Alternatively, regardless of the selected particular frequency band, depending on whether the user is providing greater signal strength is slow control format may select one of the CCK format or the OFDM format. 결론적으로, 무선 통신 링크에 대한 외부적인 교란이 있거나, 예를 들면 마이크로파 방사 누출로 인한 간섭이 있다면, 사용자는 최적의 통신을 제공하는 특정 변조 포맷을 갖는 특정 주파수 대역의 특정 주파수 채널을 무조건 선택할 수 있다. Consequently, either the external disturbances to the radio communication link, for example, if there is interference due to microwave radiation leakage, the user can unconditionally select a specific frequency of a specific frequency band channel having a particular modulation format that provide the best communication have. 또한, 소정의 주파수 채널이 선택된 후에도, 채널상의 통신이 간섭 또는 교란을 보인다면, 사용자는 이러한 교란 또는 간섭을 최소화하기 위해서 다른 주파수 대역을 선택하기 위해 대역 선택기 스위치(75)를 동작시키면서, 또는, 대안적으로, 통신을 개선하기 위해서 전압 제어 발진기를 다른 주파수 채널로 튜닝시킬 수 있다. Further, after a predetermined frequency channel is selected, if the communication on the channel seems to interference or disturbances, the user while operating the band selector switch 75 to select a different frequency band in order to minimize such disturbances or interference, or, Alternatively, it is possible to tune the voltage controlled oscillator in order to improve the communication to another frequency channel. 소정의 주파수 대역, 주파수 채널 및 변조 포맷의 선택은 도 5 및 도 6에 각각 도시된 동작 선택(17) 또는 동작 선택(47)에 의해 활성화될 수 있다. Selection of the predetermined frequency band, frequency channel and modulation format may be activated by the operation selection 17 or the operation selection 47 shown respectively in Figs. 대안적으로, 소정의 주파수 채널, 주파수 대역 및 변조 포맷의 선택은 자동적으로 제어될 수 있다. Alternatively, a predetermined frequency channel, frequency band and the selection of the modulation format may be controlled automatically. 예를 들면, 기지 단말과 휴대형 단말 사이에서 데이터를 통신하기 이전에, 수신된 무선 주파수의 신호 세기를 측정하면서, 전압 제어 발진기를 채널 단계별로 튜닝한 후 대역 단계별로도 튜닝해 볼 수 있다(예를 들면, 대역 선택기 스위치는, 예를 들어 2.4 GHz 대역 내지 5 GHz 대역에 걸쳐 변할 수 있다). For example, it can be seen to tune to a previously communicating data between the base terminal and the portable terminal, one while measuring the signal strength of the received radio frequency, tuning the voltage controlled oscillator to the channel step by step after the bands step-by-step (e.g. for example, the band selector switch may be, for example, vary over the 2.4 GHz band to the 5 GHz band). CPU(21) 또는 CPU(51)는 전압 제어 발진기가 튜닝된 각 주파수의 신호 세기를 일시적으로 저장할 수 있고, 최대 신호 세기의 채널 주파수가 선택된다. CPU (21) or a CPU (51) is capable of storing the signal strength of each frequency of the voltage controlled oscillator is tuned temporarily, a maximum signal strength of the frequency channel is selected. 대안적으로, 수신된 신호의 세기를 측정하는 대신 수신된 신호의 비트 에러율이 판정되어 최소 비트 에러율의 채널 주파수가 선택될 수도 있다. Alternatively, the bits of the received instead of measuring the strength of the received signal is the signal error rate is determined may be the channel frequency of the minimum bit error rate is selected. 본 명세서에서도 마이크 로파 방사 누출과 같은 통신 링크상의 외부 교란 또는 간섭이 신호 세기를 감소시키거나 비트 에러율을 증가시키면, 보다 좋은 신호 세기 및/또는 비트 에러율을 보이는 보다 높은 주파수 무선 통신을 지원하는 다른 주파수 채널이 선택된다. Herein in a microwave if the external disturbances or interference on a communication link, such as radiation leakage to reduce the signal strength or increase the bit error rate, better signal strength and / or another frequency supporting high frequency radio communication than showing a bit error rate the channel is selected. 도 7에 도시된 실시예와 같은 본 발명을 사용하여, 임의의 영역에서 사용되는데 할당될 수 있는 다수의 고주파수 채널이 현저하게 증가된다. The embodiment shown in Figure 7 using the present invention, such as for example, a number of higher frequency channels that can be allocated is used in any region is significantly increased. 특히, 도 2 및 3의 채널 주파수 예를 사용하면, 이제까지 3 채널(2.4 GHz에서)만이 할당될 수 있거나 4채널(5GHz에서)만이 할당될 수 있었던 반면에, 7 채널이 할당될 수 있는 것이다. In particular, the use of the channel frequency of Figure 2 and 3 example, but in the other hand so far 3 may be assigned to only the channel (2.4 GHz) could be assigned only four channels (in the 5GHz), it can be seven channels are allocated. 본 발명의 다른 실시예는 개략적으로 도 8에 도시되어 있다. Another embodiment of the invention schematically is shown in FIG. 도 7에 도시된 실시예에서 두 개의 별도 프론트 엔드 회로가 사용된 반면, 이 도면에서는 2.4 GHz 대역 및 5 GHz 대역 모두로 튜닝가능한 단일 프론트 엔드 회로(80)가 사용된다. On the other hand, two separate front end circuits are used, the figure in the 2.4 GHz band and the 5 GHz band tuning both single front end circuit 80 is possible to be used in Fig. The embodiment shown in Example 7. 전압 제어 발진기(81)는 2.4 GHz 대역 및 5 GHz 대역 모두의 다른 주파수 채널로 튜닝가능하다. A voltage controlled oscillator 81 can be tuned to different frequency channels in both the 2.4 GHz band and the 5 GHz band. 이 실시예에서, 기저 대역 프로세서(72)는 그 IF 주파수 fi가 2.4 GHz 대역 및 5 GHz 대역 모두에서 상향 변환에 대해 동일한 IF 신호를 발생시킨다. In this embodiment, the baseband processor 72 generates an IF signal for the same up-conversion for both the IF frequency fi is the 2.4 GHz band and the 5 GHz band. 그러므로 공통 대역 통과 필터(74)가 두 대역에 대해 사용된다. Therefore, a common band pass filter 74 is used for the two bands. 도 8에 도시된 실시예에서, 2.4 GHz 대역 및 5 GHz 대역 모두에서 다른 주파수 채널로 튜닝가능한 전압 제어 발진기를 구성하는 것이 어렵거나 비싸면, 동일한 전압 제어 발진기가 두 대역에서 주파수 채널을 발생시키는데 사용될 수 있도록 주파수 분할기가 전압 제어 발진기의 주파수(약 5 GHz)를, 예를 들면 1/2로 분할하는데 사용될 수 있다. In the embodiment shown in Figure 8, 2.4 GHz band and the 5 GHz in both bands is difficult to configure the tuned voltage-controlled oscillator as possible to a different frequency channel or bissamyeon, the same voltage-controlled oscillator may be used to generate frequency channels in both bands so that the frequency divider is a frequency (about 5 GHz) of the voltage-controlled oscillator, for example, it can be used to split in half. 도 8에 도시되지는 않았지만, 전압 제어 발진기(81)를 2.4 GHz 대역 또는 5 GHz 대역의 주파수 채널로 튜닝시키는 것은 최소한 부분적으로 대역 선택 제어 신호 (S10)에 의해 제어된다는 것을 알 수 있을 것이다. Although not shown in that Figure 8, the tuning of the voltage controlled oscillator 81 to a frequency channel in the 2.4 GHz band or 5 GHz band, it will be appreciated that the control by at least partial band selection control signal (S10). 도 9는 본 발명의 또다른 실시예의 블록도이다. 9 is a block diagram of yet another embodiment of the present invention. 도 9는 다른 주파수 대역을 위해 별도의 안테나가 제공된다는 점을 제외하면 도 7과 유사하다는 것을 알 수 있다. Figure 9 shows that similar if Fig. 7, except that a separate antenna provided for different frequency bands. 도 7에 도시된 실시예가 2.4 GHz 대역 및 5 GHz 대역 모두에서 공통 안테나(79)를 사용한 반면, 도 9에 도시된 실시예는 각각 별도의 안테나(79a, 79b)를 사용한다. While Fig example the embodiment shown in Figure 7 with the common antenna 79 in both the 2.4 GHz band and the 5 GHz band, the embodiment shown in Figure 9 uses separate antennas (79a, 79b), respectively. 도 10은 본 발명의 다른 실시예를 도시하는데, 이는 도 8에 도시된 실시예와 매우 유사하다. Figure 10 illustrates a further embodiment of the invention, which is very similar to the embodiment shown in Fig. 도 9의 실시예는 다른 주파수 대역을 위해 별도의 안테나(79a, 79b)가 제공된다는 점에서 도 8의 실시예와 다르다. The embodiment of Figure 9 differs from the embodiment example of Fig. 8 for example, in that for other frequency bands provided by the separate antennas (79a, 79b). 그러므로, 도 10에 도시된 바와 같이, 2.4 GHz 대역 또는 5 GHz 대역의 주파수 채널일 수 있는 프론트 엔드 회로(80)의 출력은 대역 선택 제어 신호(S10)에 의해 제어되는 선택기 스위치(76)를 통해 안테나(79a, 79b) 중의 하나로 공급된다. Therefore, the output of the, 2.4 GHz band or a 5 GHz band may be a frequency channel front-end circuit 80, which as shown in Figure 10 through the selector switch 76 which is controlled by the band selection control signal (S10) one of the antennas (79a, 79b) is supplied. 예를 들면, 통신이 2.4 GHz 대역에서 진행되어야 한다면, 스위치(76)는 안테나(79a)를 프론트 엔드 회로(80)에 접속한다. For example, if communication is to be conducted in the 2.4 GHz band, switch 76 connects the antenna (79a) to the front end circuit 80. 마찬가지로, 통신이 5 GHz 대역에서 진행되어야 한다면, 스위치(76)는 안테나(79b)를 프론트 엔드 회로에 접속한다. Similarly, if communication is to be held in the 5 GHz band, switch 76 connects the antenna (79b) to the front end circuit. 도 11은 본 발명의 다른 실시예를 도시하는 블록도이고, 2.4 GHz 대역 및 5 GHz 대역이 아닌 제3 주파수 대역이 사용을 위해 선택된다. 11 is a block diagram showing another embodiment of the present invention, a third frequency band other than 2.4 GHz band and the 5 GHz band is selected for use. 예를 들면, 이 제3 주파수 대역은 5 GHz보다 높은 주파수의 것일 수 있다. For example, this third frequency band may be of a frequency higher than 5 GHz. 도 11에서, 프론트 엔드 부(73)는 도 7에 도시된 것과 유사할 수 있지만, 대역 통과 필터(74c)에 의해 기저 대역 프로세서(72)에 접속된 제3 프론트 엔드 회로(80c)가 제공된다. 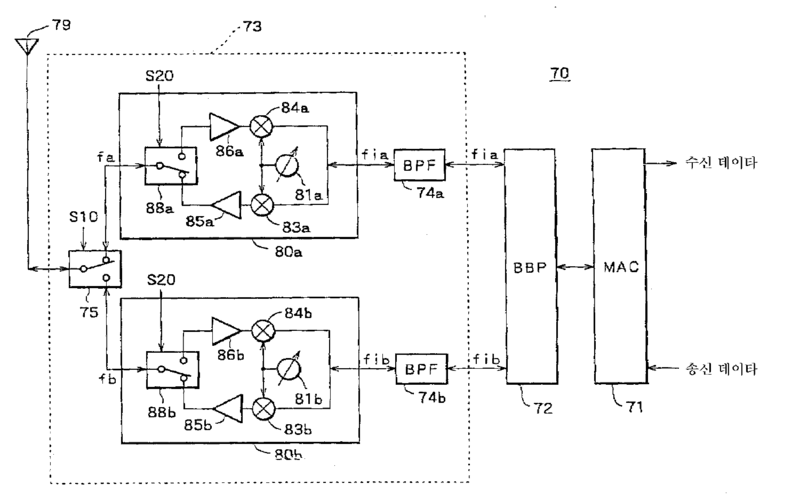 11, the front end unit 73 is provided with a third front end circuit (80c) connected to the baseband processor 72 by a can similar to, but a band-pass filter (74c) shown in Fig. 7 . 대역 통과 필터(74c)는 전술한 IF 주파수 fia 및 fib와 다른 IF 주파수를 통과시키도록 적응된다. A band-pass filter (74c) is adapted to pass the above-mentioned IF frequencies fia and fib and different IF frequency. 프론트 엔드 회로(80c)는 이 제3 대역의 고주파수 채널 fc를 발생시키고 수신하기 위해서 프론트 엔드 회로(80a, 80b)와 유사할 수 있다. The front-end circuit (80c) may be similar to front end circuits (80a, 80b) in order to generate a high-frequency channel fc of the third band and reception. 단일 대역 선택기 스위치(75')가 도 7에 도시되어 있지만, 이 선택기 스위치는, 예를 들면 대역 선택 제어 신호(S11, S13)에 의해 제어되는 두 개의 별도 스위치(75a, 75b)로서 도시되어 있다. A single band selector switch 75 'is illustrated as two separate switches (75a, 75b) which is controlled by the Figure is shown in Figure 7, this selector switch is, for example, the band selection control signal (S11, S13), but . 대역 선택 제어 신호(S11)의 제어하에서 스위치(75a)는 프론트 엔드 회로(80a)를 안테나(79)에 선택적으로 접속하거나 프론트 엔드 회로(80b) 또는 프론트 엔드 회로(80c)가 안테나에 접속하게 한다. Switches (75a) under the control of band selection control signal (S11) is selectively connected to or with the front end circuit (80b), or a front-end circuit (80c) connected to the antenna in the front-end circuit (80a) to the antenna (79) . 대역 선택기 스위치(S12)의 제어하에서 스위치(75b)는 어느 프론트 엔드 회로(80b, 80c) 중의 어느 것이 안테나에 접속될지를 판정한다. Switch (75b) under the control of band selector switch (S12) is to determine whether any is connected to an antenna in which the front-end circuit (80b, 80c). 대안으로서, 별도의 스위치(75a, 75b)를 제공하는 대신, 단일 3-웨이(3-way) 선택기 스위치가 자신에게 공급된 대역 선택 제어 신호의 상태에 따라 프론트 엔드 회로(80a), 프론트 엔드 회로(80b) 또는 프론트 엔드 회로(80c) 중의 하나에 안테나(79)를 선택적으로 접속하도록 사용될 수 있다. Alternatively, a separate switch instead of a single three-way (3-way) selector switch according to the state of the band selection control signal supplied to their front-end circuit (80a), front-end circuit for providing (75a, 75b) (80b) or the front-end circuit (80c) may be used to selectively connect the antenna 79 to one. 도 12는 도 11에 도시된 예의 대안적 실시예를 도시한다. Figure 12 illustrates an example alternative embodiment shown in FIG. 이 도면에서, 단일 프론트 엔드 회로(80)가 제공되고, 이 프론트 엔드 회로는 3 주파수 대역 각각의 다른 주파수 채널로 튜닝된다. In the figure, a single front end circuit 80 is provided, this front end circuit is tuned to a different frequency channel of the third frequency band, respectively. 도 12의 실시예의 이점은 3 대역 각각으로 상향 변환(하향 변환)하기 위해 단일 공통 IF 주파수 fi가 사용될 수 있는 점이다. Figure 12 is an embodiment of the advantage that with a single, common IF frequency fi may be used for up-conversion (down-conversion) to the third band, respectively. 마찬가지로, 대역 통과 필터(74)는 공통 IF 주파수를 사용할 때 간단하게 구성될 수 있다. Similarly, the band-pass filter 74 may be simply constituted when using a common IF frequency. 도 12에 도시된 실시예는 3개의 무선 통신 주파수 대역 각각의 소정의 주파수 채널로 튜닝되도록 프론트 엔드 회로(80)가 적응된다는 점을 제외하고는 도 8에 도시된 실시예와 매우 유사하다. The embodiment shown in Figure 12 for example, and is very similar to the embodiment shown in Figure 8, except that the three radio communication frequency band with the front end circuit 80 is adapted to be tuned to a respective predetermined frequency channels. 3-대역 프론트 엔드부(73)에 대한 다른 대안이 도 13에 도시되어 있다. The other alternative to the 3-band front end section 73 is shown in Fig. 도 13은, 2.4GHz 대역, 5GHz 대역 및 제3 대역에서의 통신용으로 3개의 별개의 안테나(79a, 79b, 79c)가 각각 이용된다는 점에서 도 11의 실시예와 상이하다. Figure 13, is different from that of the 2.4GHz band, 5GHz band and the third frequency bands of the three separate antennas for communication in that it is used (79a, 79b, 79c), each of the exemplary example of FIG. 11 in. 이러한 점에서, 도 13에 도시된 실시예는, 도 9의 프론트 엔드부(73)가 안테나(79c)에 접속된 제2 프론트 엔드 회로(80c)에 제공된다는 점을 제외하고는, 도 9에 나타난 실시예와 거의 동일하다. In this regard, the embodiment shown in Figure 13 is in, and, Figure 9, except for, that the front end portion 73 of Figure 9 provided to an antenna (79c) of the second front-end circuit (80c) connected to the it is substantially the same as shown in example. 3-대역 실시예에 대한 또 다른 대안이 도 14에 도시되어 있다. Another alternative to the 3-band embodiment is shown in Fig. 본 실시예는, 제3 주파수 대역에 대해 제3 안테나(79c)가 제공된다는 점을 제외하고는, 도 10에 도시된 2-대역 실시예와 거의 동일하다. This embodiment, and is almost the same as the 2-band embodiment shown in Figure 10 except for the point being provided by a third antenna (79c) for the third frequency band. 본 실시예를 구현하기 위해, 도 10의 스위치(76)가 도 14에 도시된 바와 같이 2개의 별개의 스위치(76a 및 76b)로 구성될 수 있다. To implement this embodiment, the switch 76 of Figure 10 can be composed of two separate switches (76a and 76b) as shown in FIG. 대안적으로, 도 10의 스위치(76)가 3-웨이 스위치로서 구성될 수도 있다. Alternatively, the switch 76 of Fig. 10 may also be configured as a three-way switch. 도 15는 도 9에 도시된 실시예의 변경이다. 15 is a change the embodiment shown in Fig. 도 9의 실시예에서, 상이한 IF 주파수 fia 및 fib는 각각 2.4GHz 대역 및 5GHz 대역과 함께 이용된다. In the embodiment of Figure 9, different IF frequencies fia and fib are used with each 2.4GHz band and the 5GHz band. 즉, 기저 대역 프로세서(72)는 데이터를 2.4GHz 프론트 엔드 회로(80a)에 의해 상향 변환된 IF 주파수 fia로 변조하는 데에 반하여, 데이터 패킷은 5GHz 프론트 엔드 회로(80b)에 의해 상향 변환되는 IF 주파수 fib로 변조된다. That is, the baseband processor 72 is opposed to the modulated data to the up-converted IF frequency fia 2.4GHz by the front-end circuit (80a), the data packet is to be up-converted by the IF 5GHz front end circuit (80b) It is modulated at a frequency fib. 도 15에서, 공통 IF 주파수 fi는 기저 대역 프로세서(72)에 의해 생성되고, 대역 선택 제어 신호 S10의 제어하에서, 이 공통 IF 주파수는 대역 선택기 스위치(77)에 의해 프론트 엔드 회로(80a) 또는 프론트 엔드 회로(80b)에 공급된다. 15, a common IF frequency fi is generated by the baseband processor 72, under the control of band selection control signal S10, a common IF frequency front-end circuit (80a) by a band selector switch 77 or the front is supplied to the end circuits (80b). 마찬가지로, 도 16은 도 7에 도시된 것에 대한 대안적인 실시예로서, 기저 대역 프로세서(72)에 의해 생성되는 공통 IF 주파수 fi를 이용하고 있다. Similarly, Figure 16 is using a common IF frequency fi produced by the baseband processor 72, an alternative embodiment to that shown in Fig. 도 16에서, 이 공통 IF 주파수는 대역 통과 필터(74)에 의해 대역 선택기 스위치(77)를 경유하여 프론트 엔드 회로(80a) 또는 프론트 엔드 회로(80b)에 공급된다. 16, this common IF frequency is supplied to the band pass filter 74 to front end circuit (80a) or the front-end circuit (80b) via a band selector switch 77 by the. 따라서, 스위치(75 및 77)는, 어떤 주파수 대역이 통신용으로 선택되는지에 따라, 프론트 엔드 회로(80a) 또는 프론트 엔드 회로(80b)를 통해 안테나(79)와 대역 통과 프로세서(72) 간의 통신 경로를 확립시킨다. Therefore, the switch (75 and 77), which frequency band is in accordance with that selected for communication, communication path between a front end circuit (80a) or the antenna 79 through the front-end circuit (80b) and the band pass processor 72 the thus established. 도 17은 도 13에 도시된 실시예에 대한 변경을 도시하고 있다. Figure 17 shows modifications to the embodiment shown in Fig. 도 13의 실시예에서는 별개의 IF 주파수 fia, fib 및 fic가 이용되고 있는 데에 반하여, 도 17은 공통 IF 주파수 fi를 이용한다. In the embodiment of Fig 13 as opposed to having been used in a separate IF frequencies fia, fib and fic, Figure 17 uses a common IF frequency fi. 이 공통 IF 주파수는, 대역 선택 제어 신호 S11 및 S12의 제어하에서, 대역 선택기 스위치(77a 및 77b)를 경유하여 프론트 엔드 회로(80a, 80b, 80c)로/로부터 공급된다. This common IF frequency, under the control of band selection control signals S11 and S12, by way of a band selector switch (77a and 77b) is supplied from the in / front-end circuit (80a, 80b, 80c). 마찬가지로, 도 18은 도 11에 도시된 실시예의 변경을 도시하고 있다. Similarly, Figure 18 shows an example to change the embodiment shown in Fig. 도 11의 실시예는 프론트 엔드 회로(80a, 80b, 80c) 각각에 대하여 별개의 IF 주파수를 이용하는 데에 반하여, 도 18의 실시예는 공통 IF 주파수를 이용한다. Embodiment of Figure 11 as opposed to having to use a separate IF frequencies for each front end circuit (80a, 80b, 80c), the embodiment of Figure 18 uses a common IF frequency. 스위 치(75a 및 75b)는 어떤 주파수 대역이 선택되는지에 따라 안테나(79)를 적합한 프론트 엔드 회로에 연결시키고, 스위치(77a 및 77b)는 그 프론트 엔드 회로를 대역 통과 필터(74)를 경유하여 기저 대역 프로세서(72)에 연결시킨다. Via a switch (75a and 75b) has an antenna (79) and connect to the appropriate front end circuit, the switches (77a and 77b) passes through the front end circuit band filter 74, depending upon which frequency band is selected It connects to the baseband processor 72. 지금까지 설명된 실시예들은 2개 또는 3개의 상이한 주파수 대역을 이용하는 것을 제시했지만, 이론적으로는 주파수 대역의 수에 한계가 없다는 것을 알 것이다. The embodiments described so far examples are presented, but the use of two or three different frequency bands, in theory, it will be apparent that there is a limit to the number of frequency bands. 이와 같은 주파수 대역의 개수에 대한 실제 제약은 프론트 엔드 회로를 구성하기 위한 비용과 본 발명에서 이용되는 가용 주파수 및 대역폭의 할당이다. The physical constraints for the number of such frequency bands is the allocation of available frequencies and bandwidths for use in the present invention and cost for constructing the front end circuits. 도 19는 본 발명의 또 다른 실시예를 도시하고 있다. Figure 19 shows a further embodiment of the invention. 도 19는, 프론트 엔드 회로(80a 및 80b)에 의해 공급되고 그에 의해 생성된 공통 IF 주파수를 이용한다는 점을 제외하고는, 도 7에 도시된 실시예와 유사하다. Figure 19, and is similar to the embodiment shown in Figure 7 except that it is supplied by the front-end circuit (80a and 80b) uses a common IF frequency generated thereby. 또한, 도 19에서, 기저 대역 프로세서(72)는 각각 CCK 및 OFDM 포맷에 따라 동작하도록 된 별개의 기저 대역 프로세서(72a 및 72b)를 포함하는 것으로 도시되어 있다. Further, in Fig. 19, the baseband processor 72 is illustrated as including a separate baseband processor (72a and 72b) to operate in accordance with the CCK and OFDM formats, respectively. 스위치(72p 및 72q)는, 변조 포맷 제어 신호 S30의 제어하에서, 프론트 엔드부(73)를 CCK 기저 대역 프로세서(72a) 또는 OFDM 기저 대역 프로세서(72b)를 경유하여 미디어 액세스 제어부(71)에 연결시킨다. Switches (72p and 72q), the modulation format under the control of control signal S30, the front end portion 73 connected to the CCK baseband processor (72a) or OFDM baseband processor (72b), the media access control section 71 via the thereby. 전형적으로, 대역 선택 제어 신호 S10이 2.4GHz 대역을 통신용으로 선택하는 경우, 변조 포맷 제어 신호 S30은 CCK 기저 대역 프로세서를 선택한다. Typically, if band selection control signal S10 selects the 2.4GHz band for communication, modulation format control signal S30 selects the CCK baseband processor. 또는 전형적으로, 대역 선택 제어 신호가 5GHz 대역을 통신용으로 선택하는 경우, 변조 포맷 신호는 OFDM 기저 대역 프로세서를 선택한다. Or typically, if the band selection control signal selecting the 5GHz band for communication, modulation format signal selects the OFDM baseband processor. 주파수 대역의 선택 및 변조 포맷의 선택은 기지 단말과 휴대형 단말 양자에서 동일하다는 것을 알 수 있을 것이다. The choice of selection and modulation format of the frequency band is to be understood that it is the same in both the base terminal and the portable terminal. 이들 단말 중의 한쪽 또는 다른쪽은, 적절한 마스터 선택 신호를 슬레이브 단말에 보내는 마스터 단말로 생각될 수 있다. One or the other of these terminals, can be thought of an appropriate master selection signal to the master terminal device is sent to the slave terminal. 도 20은 도 19의 프론트 엔드부(73)를 더 상세하게 도시하고 있다. 20 are further details of the front end section 73 of Fig. 도 20의 프론트 엔드부(73)는, IF 주파수 fi의 공통 IF 신호를 이용한다는 점을 제외하고는 도 7에 도시된 프론트 엔드부와 유사하다는 것을 알 수 있을 것이다. The front end section 73 of FIG. 20, except that is uses a common IF signal of IF frequency fi will be appreciated that similar to the front end unit shown in Fig. 스위치(77)는, 대역 선택 제어 신호 S10의 제어하에서, 어떤 주파수 대역이 선택되는지에 따라, 대역 통과 필터(74)로부터의 IF 신호를 프론트 엔드 회로(80a) 또는 프론트 엔드 회로(80b)에 결합시킨다. Switch 77, under the control of band selection control signal S10, which frequency band is coupled to a bandpass filter the IF signal from the 74 to front end circuit (80a) or the front-end circuit (80b) depending on whether the selection thereby. 마찬가지로, 스위치(77)는 고주파 무선 신호가 수신되면, 프론트 엔드 회로(80a) 또는 프론트 엔드 회로(80b)로부터의 IF 신호를 대역 통과 필터에 결합시킨다. Similarly, the switch 77 when the high frequency radio signal reception, couples the IF signal from the front-end circuit (80a) or the front-end circuit (80b) for band-pass filter. 도 21a-21c는 상이한 주파수 대역과 상이한 변조 포맷을 갖는 프론트 엔드부 및 기저 대역 프로세서들의 전형적인 배치를 도시하고 있다. Figure 21a-21c illustrates a typical arrangement of the front end unit and the baseband processors having different frequency bands and different modulation formats. 예를 들어, 도 21a에 도시된 무선 통신부(90A)는 2.4GHz 대역에서 통신할 때의 CCK 변조 포맷의 이용을 도시하고 있다. For example, the wireless communication unit (90A) shown in Fig. 21a illustrates the use of the CCK modulation format when communicating in a 2.4GHz band. 마찬가지로, 도 21b에 도시된 프론트 엔드부(80B)는 5GHz 대역에서 전송할 때의 OFDM 포맷의 이용을 도시하고 있다. Similarly, the front end portion (80B) shown in Fig. 21b illustrates the use of the OFDM format when transmitting in the 5GHz band. 도 21c에 도시된 프론트 엔드부(70D)는, 어떤 주파수 대역이 선택되는지에 따라 개별적으로 선택되는 CCK 및 OFDM 포맷 각각으로 동작할 수 있는 기저 대역 프로세서의 이용을 도시하고 있다. The front end portion (70D) shown in Figure 21c illustrates the use of a baseband processor capable of operation in which frequency band is selected if individually CCK and OFDM formats that are selected according to each. 무선 통신부(70D)는 도 19에 도시된 형식일 수 있음을 알 수 있다. A wireless communication unit (70D) may be seen that the format shown in Fig. 대안적으로, 듀얼 포맷 동작을 할 수 있는 기저 대역 프로세서가 무선 통신부(70D)의 기저 대역 프로세서로서 이용될 수 있다. Alternatively, a baseband processor capable of dual format operation may be used as the baseband processor of the wireless communication unit (70D). 이제, 도 22을 참조하면, 예를 들어 연산부(17) 또는 연산부(47)에 응답하여, 간섭 및 교란이 최소인 최적의 통신을 행하도록 주파수 대역 및/또는 변조 포맷을 선택하는 CPU(21) 또는 CPU(51)의 동작을 설명하는 플로우차트가 나타나 있다. Referring now to Fig. 22, for example, operation unit 17 or in response to an operation section 47, the interference and the CPU (21) to disturb the selection of the band and / or modulation format to effect at least the optimal communication or there is shown a flow chart illustrating the operation of the CPU (51). 따라서, 도 22의 플로우차트에 의해 나타난 루틴은, 초기 선택된 주파수 채널 상에 나타날 수 있는 교란의 함수로서, 주파수 대역 내에서 기지 단말(10)과 휴대형 단말(40) 간에서 데이터를 송수신하기 위한 주파수 채널을 선택한다. Thus, the routine shown by the flowchart of Figure 22 is, as a function of disturbance that may appear on the initial selected frequency channel, a frequency for sending and receiving data between base terminal 10 and portable terminal 40 in the frequency band select the channel. 마찬가지로, 이 루틴은 변조 포맷을 선택된 주파수 대역과 호환되는 것 또는 개선된 데이터 송수신을 제공할 수 있는 것으로 변경시키도록 동작한다. Similarly, this routine operates to change that can provide one that is compatible with the selected frequency band of the modulation format or an improved data transmission and reception. 무선 주파수 통신용으로 선택된 주파수 대역과 무관하게, CCK 포맷 또는 OFDM 포맷 중 어느 것이라도 데이터의 변복조에 이용될 수 있는 것으로 가정하자. Let's also assume that that may be used for modulation and demodulation of data, regardless of which of the selected frequency band, CCK format or the OFDM format would by radio frequency communication. 도 22에 설명된 루틴에서, 우선, 명령 S1은 기지 단말 및 휴대형 단말 양자의 무선 통신부 내의 프론트 엔드부를 2.4GHz 대역으로 변경한다. In the routine described in Fig. 22, first, a command S1 is changed to the front-end parts of the 2.4GHz band in the base station and the wireless communication unit of the portable terminal both. 예를 들어, 도 7에 도시된 실시예에서, 프론트 엔드 회로(80a)가 선택된다. For example, in the embodiment shown in Figure 7, the front end circuit (80a) is selected. 그 다음, 루틴은 문의 S2로 진행하여, 허용 가능한 무선 통신의 수신이 가능한지를 결정한다. Then, the routine advances to inquiry S2 to determine, whether the reception of the allowable radio communication. 예를 들어, 수신된 신호의 신호 강도, 또는 그 신호의 에러 데이터 레이트가 측정된다. For example, it is determined that the signal strength of the received signal or the error data rate of that signal. 문의 S2의 응답이 긍정이면, 루틴은 명령 S3로 진행하여, 기지 단말 및 휴대형 단말 양자의 기저 대역 프로세서를 CCK 포맷으로 동작하도록 변경한다. If the contact S2 of the positive response, the routine advances to instruction S3, changes so as to operate the base terminal and the portable terminal both of the baseband processor in the CCK format. 그 다음, 루틴은 문의 S4로 진행하여, 허용 가능한 복조가 나타나는지를 결정한다. Then, the routine advances to inquiry S4, determines the acceptable demodulation appear. 예를 들어, CCK 포맷으로 변조되어 현재 2.4GHz 대역의 주파수 패널로 전송되는 데이터가 복조되고, 복조된 데이터의 에러 레이트가 감시된다. For example, modulated in the CCK format is demodulated and the current data to be transmitted at a frequency of 2.4GHz band panel, the error rate of the demodulated data is monitored. 이 에러 레이트가 허용 가능 한 경우, 문의 S4의 응답은 긍정이 되고, 루틴은 명령 S5로 진행하며, 그 결과 2.4GHz 대역에서 CCK 변조를 이용하여 통신이 행해진다. If the error rate is acceptable, inquiry S4 is the response is affirmative, the routine is performed communication using CCK modulation advances to instruction S5, from the resulting 2.4GHz band. 그러나, 문의 S2의 응답이 부정인 경우, 루틴은 주파수 대역을 5GHz로 변경하고, 명령 S7은 변조 포맷을 OFDM으로 변경하도록 행해진다. However, if the response is negative, the contact S2, the routine is performed to change the frequency band in 5GHz and S7 command changes the modulation format to OFDM. 그러면, OFDM 포맷으로 변조된 데이터가 만족스럽게 복조될 수 있는지를 결정하기 위한 문의 S8이 행해진다. Then, the inquiry S8 for determining whether the data modulated in the OFDM format can be satisfactorily demodulated performed. 이 문의의 결과가 긍정이면, 루틴은 명령 S5로 진행하고, 통신은 5GHz 대역으로 유지되며 OFDM 포맷으로 행해진다. If the result is affirmative in this statement, the routine advances to instruction S5 and communication is maintained in the 5GHz band is performed by the OFDM format. 그러나, 문의 S8의 응답이 부정이면, 루틴은 변조 포맷을 OFDM에서 CCK로 변경시키는 명령 S9로 진행한다. However, if the answer is negative in contact S8, the routine advances to instruction S9 which changes over the modulation format from OFDM to CCK. 이제, 통신은 5GHz 대역으로 유지되며, CCK 포맷을 따라 행해진다. Now, communication is maintained in the 5GHz band, performed in accordance with the CCK format. 문의 S4의 응답이 부정인 경우, 즉 CCK 포맷에 따른 2.4GHz 대역의 통신은 허용 가능하게 복조되지 않는 경우(2.4GHz 대역의 주파수 채널의 신호 강도는 허용 가능했음), 변조 포맷을 CCK로부터 OFDM으로 변경하기 위한 명령 S6이 행해진다. If the answer is negative in contact S4, i.e., the modulation format when communicating in the 2.4GHz band is not acceptably demodulation (signal strength of a frequency channel in the 2.4GHz band is haeteum acceptable), in accordance with the CCK format from OFDM to CCK the command for changing S6 is performed. 따라서, 통신은 2.4GHz 대역으로 유지되고 OFDM 포맷으로 행해진다. Thus, communication is maintained in the 2.4GHz band is performed by the OFDM format. 본 발명이 몇몇의 바람직한 실시예를 참조하여 설명되었지만, 본 기술 분야의 숙련된 기술자라면 본 발명의 취지 및 범위를 벗어나지 않고서도 다양한 변경 및 수정이 이루어질 수 있음을 알 것이다. While the invention has been described with reference to some preferred embodiments, if the skilled in the art will recognize that various changes and modifications can be made without departing from the spirit and scope of the invention. 예를 들어, 기지 단말(10)은 디지탈 TV 전송 등의 디지탈 브로드캐스트 전송을 수신할 수 있는 튜너를 포함할 수 있다. For example, base terminal 10 may include a tuner capable of receiving digital broadcast transmissions, such as digital TV transmissions. 이러한 전송 내에 포함된 정보는 복구되고 데이터 패킷 내로 수집되어, 무선 통신부(70)에 의해 변조 및 상향 변환된다. The information contained in this transmission is recovered and collected into data packets, modulated and up-converted by radio communication section 70. 본 발명에 따르면, 기지 단말은, 양 단말의 무선 통신부 내의 프론트 엔드부를 특정 변조 포맷을 이용하여 외부 간섭 및 교 란의 영향이 최소화되도록 선택된 주파수 대역 내의 선택된 주파수 채널로 변경함으로써, 휴대형 단말과 통신을 한다. According to the invention, the base station is, by changing, using a particular modulation format, the front end portion in the wireless communication section of both terminals to the frequency channel selected in the selected frequency band to minimize the effects of external interference, and T is, the portable terminal and the communication do. 즉, 선택되는 특정 주파수 채널 및/또는 변조 포맷은 주변에 존재하는 교란의 함수로 생각될 수 있다. That is, the particular frequency channel and / or modulation format that is selected may be thought of as a function of the disturbances present in the ambient. 도 1은 무선 통신 장치의 예를 도시하는 블록도. 1 is a block diagram showing an example of a wireless communication device. 도 2는 2.4 GHz 대역의 채널 구성을 도시하는 개략도. Figure 2 is a schematic diagram showing a channel configuration in the 2.4 GHz band. 도 3은 5 GHz 대역의 채널 구성을 도시하는 유사 도면. 3 is a view similar showing the channel configuration of the 5 GHz band. 도 4는 본 발명을 결합한 무선 LAN 시스템의 예의 블록도. 4 is an example block diagram of a wireless LAN system that combines the present invention. 도 5는 기지 단말의 예를 도시하는 블록도. Figure 5 is a block diagram showing an example of a base terminal. 도 6은 휴대형 단말의 예를 도시하는 블록도. Figure 6 is a block diagram showing an example of a portable terminal. 도 7은 본 발명의 제1 실시예에 따른 무선 통신 장치의 블록도. Figure 7 is a block diagram of a wireless communication device according to a first embodiment of the present invention. 도 8은 본 발명의 다른 실시예에 따른 무선 통신 장치의 블록도. Figure 8 is a block diagram of a radio communication apparatus according to another embodiment of the present invention. 도 9는 본 발명의 또 다른 실시예에 따른 무선 통신 장치의 블록도. Figure 9 is a block diagram of a radio communication apparatus according to an embodiment of the present invention. 도 10은 본 발명의 또 다른 실시예에 따른 무선 통신 장치의 블록도. Figure 10 is a block diagram of a radio communication apparatus according to an embodiment of the present invention. 도 11은 본 발명의 또 다른 실시예에 따른 무선 통신 장치의 블록도. Figure 11 is a block diagram of a radio communication apparatus according to an embodiment of the present invention. 도 12는 본 발명의 또 다른 실시예에 따른 무선 통신 장치의 블록도. Figure 12 is a block diagram of a radio communication apparatus according to an embodiment of the present invention. 도 13은 본 발명의 또 다른 실시예에 따른 무선 통신 장치의 블록도. 13 is a block diagram of a wireless communication device according to an embodiment of the present invention. 도 14는 본 발명의 또 다른 실시예에 따른 무선 통신 장치의 블록도. Figure 14 is a block diagram of a radio communication apparatus according to an embodiment of the present invention. 도 15는 본 발명의 또 다른 실시예에 따른 무선 통신 장치의 블록도. Figure 15 is a block diagram of a radio communication apparatus according to an embodiment of the present invention. 도 16은 본 발명의 또 다른 실시예에 따른 무선 통신 장치의 블록도. Figure 16 is a block diagram of a radio communication apparatus according to an embodiment of the present invention. 도 17은 본 발명의 또 다른 실시예에 따른 무선 통신 장치의 블록도. 17 is a block diagram of a radio communication apparatus according to an embodiment of the present invention. 도 18은 본 발명의 또 다른 실시예에 따른 무선 통신 장치의 블록도. Figure 18 is a block diagram of a radio communication apparatus according to an embodiment of the present invention. 도 19는 본 발명의 또 다른 실시예에 따른 무선 통신 장치의 블록도. 19 is a block diagram of a radio communication apparatus according to an embodiment of the present invention. 도 20은 도 19에 도시된 프론트 엔드부의 상세한 구성을 도시하는 블록도. 20 is a block diagram fully illustrating a structure of a front-end portion shown in Fig. 도 21a - 21c는 상이한 주파수 대역과 상이한 변조 포맷을 사용하는 단일 대역 무선 LAN 시스템을 도시하는 블록도. Figure 21a - 21c is a block diagram showing a single band radio LAN systems using different frequency bands and different modulation formats. 도 22는 본 발명에 사용할 수 있는 주파수 대역 및 변조 포맷 전환 루틴의 예를 도시하는 플로우차트. 22 is a flowchart showing an example of a frequency band and modulation format conversion routine which can be used in the present invention. 상기 주파수 전환 선택기는, 복수 채널을 갖는 주파수 대역으로부터, 다른 채널을 갖는 주파수 대역의 채널로 안테나를 전환하는 무선 통신 장치. A wireless communications apparatus that the switching frequency selector, from the frequency band having a plurality of channels, switching the antenna to a frequency band of the channel with other channels. 제1항에 있어서, 상기 프론트 엔드부는 각각이 상기 복수의 주파수 대역 각각에서 튜닝가능한 복수의 프론트 엔드 회로를 포함하는 무선 통신 장치. The method of claim 1, wherein the front end section a wireless communication device including a plurality of front-end circuit to be tuned from the plurality of frequency bands, respectively, each. 제1항에 있어서, 각각이 상기 복수의 주파수 대역 각각 내에서 고주파수 신호를 송신 및 수신하는 복수의 안테나를 더 포함하는 무선 통신 장치. The method of claim 1, wherein each of the wireless communication device further comprising: a plurality of antennas for transmitting and receiving a high frequency signal in said plurality of frequency bands, respectively. 제1항에 있어서, 상기 복수의 주파수 대역 모두에서 고주파수 신호를 송신 및 수신하는 공통 안테나를 더 포함하는 무선 통신 장치. The method of claim 1, wherein the radio communication apparatus further comprising a common antenna for transmitting and receiving high frequency signals from all the plurality of frequency bands. 상기 제어부는, 복수의 채널을 갖는 주파수 대역으로부터, 다른 채널을 갖는 주파수 대역의 채널로 안테나를 전환하는 무선 통신 장비. Wherein, the radio communication equipment from a frequency band having a plurality of channels, switching the antenna to a frequency band of the channel with other channels.